The Hockey Show, Canada's only campus-produced radio show that strictly talks hockey, is back tonight with our PLEDGE-O-RAMA show! The ol' radio station known as CJUM-FM 101.5 kicked off its annual week-long pledge drive known as PLEDGE-O-RAMA earlier this week, and we're nearing our goal! We do this every year at the radio station as we ask our listeners to give a little back to our independent transmission that goes out on the 101.5 FM frequency, and our goal this year is $36,000! We do need some help from you, my readers and our listeners, as we're still a little short, so will you lend us some support? What is this annual pledge drive known as Pledge-O-Rama? UMFM, for those that are unaware, is a volunteer-driven, non-profit radio station located on the campus of the University of Manitoba from where The Hockey Show and other great programming originates. 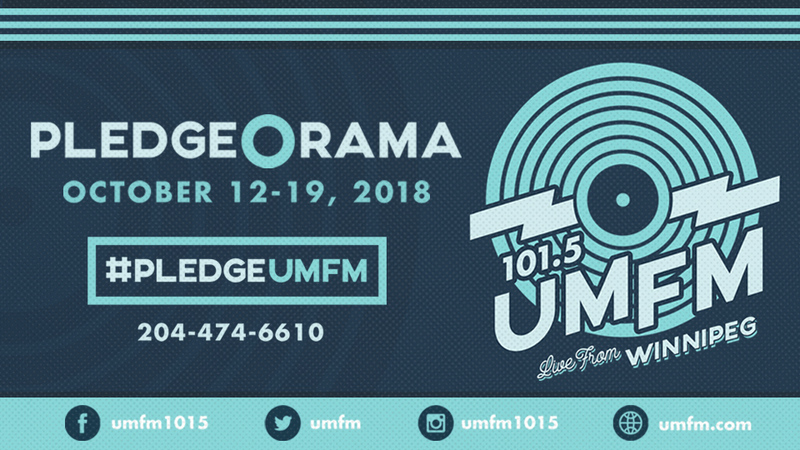 The station has been operating since 1998, and your donations via the Pledge-O-Rama campaigns over the years have allowed UMFM to accomplish a number of goals including upgrading the transmitter (hear us farther! ), gaining better technology so we can do things like remote broadcasts (Bisons football and hockey! ), and making upgrades to UMFM's in-studio equipment and facilities (hear us clearer!). Basically, the money you donate goes directly into making our programming and our broadcast quality better! If you're a fan of The Hockey Show, all we ask is if it's within your means to make donation in whatever amount it may be that you can afford so that we can continue to do great things like broadcasting Bisons men's and women's hockey, broadcasting from community arenas and events like we did in London, Ontario where the U SPORTS National Women's Hockey Championship was help, and bring great people on the show like we did all summer. While Beans and I won't see any money directly, UMFM will be using the money this year to set up a digital music library among the projects that have been identified by the Board of Directors so that UMFM continues to break new ground and implement new technology to make your listening experience better! HOST THE SHOW: you can sit in as a featured host with Teebz and Beans and debate all things hockey on a date of your choosing! We'll give away two of these to be used at any time by the winners within the next calendar year (before next year's Pledge-O-Rama). WE VISIT YOU: The Hockey Show will come out and do the show from your local rink within southern Manitoba! We'll gather up the gear, make our way out to your local team's rink, promote your team or a team of your choosing on the show, and do our one-hour of craziness from your community! We'll give away two of these to be used at any time by the winners within the next calendar year (before next year's Pledge-O-Rama). TEAM OF YOUR CHOICE: As you may be aware, The Hockey Show holds its Survivor: NHL Playoffs contest every year. If your name is chosen in the draw and options #1 and #2 don't work for you due to distance or some other factor, we'll give you a chance to call your own shot by selecting the team of your choice in this year's Survivor pool. Once your choice is made, however, there's no going back! The prizing for the winner is always worth more than $50, so your pledge may pay off in a big way if you choose your team wisely! There is one of these incentives to be won. Tune in tonight to hear how you can donate while Teebz and Beans discuss concussions and the rash of dangerous hits seen in the NHL lately, the Bisons and their respective schedules, and much more only on The Hockey Show found exclusively on 101.5 UMFM, on the UMFM app, on the UMFM.com web stream!